Did you know “Mater” is from Kansas? He is – or at least the 1951 International boom truck used for his model is – and you can visit it in Galena. If you are not up on your Disney lore of, say the past 10 years or so, “Tow Mater” is the tow truck/best friend of “Lightning McQueen” in the movie Cars. Mater lives in a town called Radiator Springs that – aside from the mesas and wide expanses surrounding it – might as well be Galena. The people who made Cars came through Galena when they were doing research for the movie. They stopped at an old gas station at the end of town and saw an old tow truck sitting on the side of the building. It had been there so long, a tree was growing up through the boom, but it presented a sight from which the most lovable rust bucket of all times grew, too. The spot where Mater was born is also the location of “Four Women on the Route,” an information center and gift shop. It is only open seasonally, but displays Mater out front year-round. If you want to do a little pre-visit prep for your kids, the shop is featured on the DVD Blu-ray version of Cars II as a special feature, and the story of how Mater was discovered is recounted in a book called The Art of Cars. Our family stopped at Four Women on the Route to meet Mater and drove on part of the original road north of town heading east towards the Missouri border. We drove over the Front Street Bridge, which is just past the old gas station. The road and bridge are worn, but you can be sure you are on the original route by the markers on the pavement. 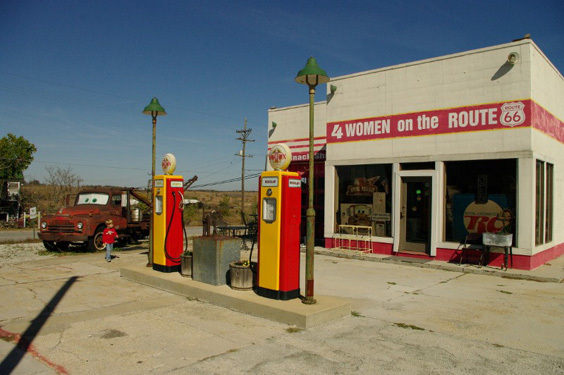 This is just one small piece of Route 66 history you’ll find in the southeast corner of Kansas. The length of the road through Kansas is short, only 13.2 miles, but the story of the road here is strong. Galena is making an extra effort to keep it alive. A new park, several restaurants, a coffee shop, original buildings and piped in period music contribute to the nostalgic atmosphere drivers along Route 66 can enjoy there today. If you go in the off season (November - March) Main Street may seem a little slow, but that might just better illustrate the story of Route 66 the movie Cars told. A hometown off the beaten path kept alive by people who love it. If you are traveling Route 66 in Kansas, you also won’t want to miss the rainbow arch bridge a few miles west near Riverton.This bridge was constructed in 1923 over Brush Creek. When it became the only remaining Marsh arch bridge on Route 66, it was listed on the National Register of Historic Places. This Federal Aid Project Number 142 by the Kansas Highway Commission has been taken off the main route and can be enjoyed by foot traffic. Our family walked here too, and I personally enjoyed thinking of my grandfather going over this bridge in the late 1920s during a fabled trip he took from Kansas City to Pike’s Peak. Back then they drove a model T and camped along the way. They may have taken this route, because Kansas was the first state to pave their entire stretch of the highway. At the bridge we met some visitors from England who were taking the route from Chicago to L.A. – just like thousands of foreign visitors and American adventurers each year. Kansas is a place that touches the traveler – even if they just intend on passing through. That was true on Route 66 and it’s still true today.